For a more comprehensive review of how substance abuse, including opioid misuse, affects rural communities, please see the Substance Abuse in Rural Areas topic guide, and in particular What is opioid abuse, and what effect has it had in rural communities? This multi-year initiative will support treatment for and prevention of substance use disorder, beginning with awards of up to 75 one-year planning grants to rural communities through the Rural Communities Opioid Response Program – Planning (RCORP) funding opportunity. $19 million has been awarded to 95 rural health organizations for these planning grants. JBS International has been awarded a cooperative agreement to provide technical assistance to the RCORP grantees. In addition, over $6 million was awarded to 26 rural health organizations through the Rural Health Opioid Program (RHOP). Works to address the opioid crisis in rural communities by improving coordination of and reducing potential overlap among federal responses. Established in May 2018 and co-chaired by the Office of National Drug Control Policy (ONDCP) and U.S. Department of Agriculture (USDA). In October 2018, the IWG issued Federal Resources for Rural Communities to Help Address Substance Use Disorder and Opioid Misuse, a directory of federal funding programs, service providers, technical assistance, training, and more. View USDA funding programs available to support projects addressing rural opioid misuse, read about successful programs, and find a wide range of resources from throughout the federal government. Learn about overdose deaths in rural areas, policy options to address the opioid crisis, and CDC resources related to preventing drug overdose. A program to develop and disseminate training and technical assistance for rural communities on addressing opioid issues affecting these communities. ROTA grantees have been announced and the 2018 funding announcement provides background information. Expands and improves access to quality opioid and substance use disorder treatment in rural and underserved areas. A site expansion initiative made new categories of outpatient services and sites eligible to hire NHSC providers. NHSC also launched the NHSC Substance Use Disorder Workforce Loan Repayment Program for recruiting and retaining providers to expand access to treatment. A campaign to help bring attention to the rural opioid crisis and help rural communities and individuals find resources for treatment and prevention. A central resource for sharing information and increasing communication related to opioids with tribal stakeholders. Addresses pain management, prevention strategies, treatment, and crisis response. Also includes information on the IHS National Committee on Heroin Opioids and Pain Efforts (HOPE). Resources to help locate treatment, an overview of the opioid epidemic, and the HHS 5-point strategy to address it. Includes resources and information for prevention, treatment, and recovery. Highlights efforts underway at HRSA to address the opioid crisis, including expanding access, use of telehealth, primary care training, and more. Also identifies HRSA-supported resources and technical assistance centers. Interactive map providing access to county-level drug overdose deaths, including deaths due to opioid overdose. Includes the option to overlay socioeconomic data, limit to rural or urban counties, and view by timeframe for 2007-2011 and 2012-2016. Highlights the efforts underway at CMS to address the opioid epidemic focused on prevention, treatment, and data utilization to target prevention and treatment activities. Includes some information specific to rural areas. Information to help patients, providers, and the public understand opioids and learn how to prevent opioid overdose. Provides access to data and CDC reports on the opioid crisis. Provides background information on how the opioid crisis developed, as well as an overview of what the National Institutes of Health (NIH) is doing to address it. Includes related NIDA/NIH resources, as well as resources from other federal sources. A collection of resources to help incorporate evidence-based practices into communities and clinical settings. Includes opioid-specific resources (select under Topic Area). Highlights videos, online courses, tools, and SAMHSA grantee stories related to addressing the opioid crisis. 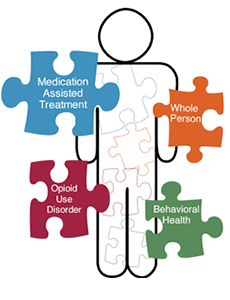 Resources, models, training, and technical assistance for developing integrated primary and behavioral health services to better address the needs of individuals with mental health and substance use conditions. Reports and information related to addiction, with a special focus on resources to address the opioid crisis. Describes efforts underway at the OIG to address the opioid crisis by identifying opportunities to improve HHS programs, detecting and addressing fraud, and sharing data and methods with partners. Includes related reports and resources. A public-private partnership focused on sharing knowledge related to the opioid crisis, aligning initiatives, and advancing shared solutions. Highlights initiatives, studies, and publications from the National Academies that are focused on the opioid epidemic. A wide range of public health training opportunities related to the opioids, including recorded webcasts and self-study. Includes training from the federal agencies and national organizations. The Funding & Opportunities section of this guide identifies grants aimed at addressing the opioid crisis, with a focus on national opportunities available to rural and tribal communities. For additional state and regional funding, see the Online Library: Funding & Opportunities lists for Illicit drug use and Prescription drug abuse. For national programs that more broadly address substance abuse, including national and state opportunities, see Substance abuse. The Rural Prevention and Treatment of Substance Use Disorders Toolkit presents resources, models, and program examples to guide the development and implementation of successful substance abuse prevention and treatment programs for rural communities. In the sections below, you’ll find program models from this toolkit that can be used to address specific aspects of opioid treatment and prevention. A directory of federal funding programs, service providers, technical assistance, training, and more to address the opioid crisis in rural communities. Issued by the Rural Opioid Federal Interagency Working Group (IWG). A January 2018 Rural Health Research Gateway webinar featuring John Gale of the Maine Rural Health Research Center. Learn about cost-effective, evidence-based prevention, treatment, and recovery programs that have been successfully implemented in rural communities. Also from the Maine Rural Health Research Center, an April 2017 paper examining strategies for dealing with the rural opioid crisis, including prevention, treatment, and recovery services. Uses data from interviews with key stakeholders in Indiana, North Carolina, Vermont, and Washington. A toolkit from the National Organization of State Offices of Rural Health based on a 2015 Federal Office of Rural Health Policy (FORHP) pilot, the Rural Opioid Overdose Reversal (ROOR) Program. Includes a report documenting lessons learned from the ROOR grant recipients, as well as a webinar recording, training materials, marketing and outreach materials, and data sources. To counter the high death rates related to opioid overdoses in Wilkes County, North Carolina, Project Lazarus equips prescribers, patients, and communities with education and tools needed to lessen the drug supply and demand and lower death rates. Project VISION in Rutland, Vermont, has been working since 2012 to address the underlying issues of crime in its community, such as mental illness, poverty, and substance abuse, particularly with opioids. Addresses the complex problem of heroin and opiate addiction through a four pillar approach, including prevention, treatment, harm reduction, and law enforcement. Additional programs focused on particular aspects of the opioid response are identified below. Federal and state agencies are funding research studies and collecting and sharing a wide range of data to help understand the opioid crisis, so it can be responded to effectively. Opioid Use and Treatment Availability – Rural Health Research Recap summarizing findings from FORHP-funded rural health research center studies. Opioid-Related Hospital Use – National data on inpatient stays and emergency department visits by level of rurality. MMWR Opioid Reports – Lists reports in the Morbidity and Mortality Weekly Report focused on opioid misuse. Many of these reports include data on rural opioid use. Drug Overdose Deaths in the United States – Interactive map identifying drug overdose deaths by county, along with related sociodemographic and economic information. Data Sources and Data-Linking Strategies to Support Research to Address the Opioid Crisis – Identifies data sources available to conduct research on the opioid crisis and describes methods for linking or merging these data sources. Toolkit: Using Data Analysis To Calculate Opioid Levels and Identify Patients At Risk of Misuse or Overdose – HHS Office of the Inspector General guide for using prescription drug claims data to analyze patients' opioid levels and identify those at risk of opioid misuse or overdose. Rural Communities in Crisis: A Critical Count to Save Lives During the Opioid Epidemic – A toolkit and calculation tool rural communities can use to estimate the size and characteristics of the population who inject drugs, in order to estimate service needs. See the Resources section of this guide for many additional reports and other resources describing the rural opioid crisis. Avoiding unnecessary use of opioids is a key method of preventing opioid misuse before it starts. Rural healthcare providers are addressing pain management and opioid prescribing to help protect their patients. In two midcoast Maine emergency departments, an easy-to-follow, one page protocol was implemented to assist providers in treating patients complaining about pain and also patients presenting opioid or controlled substance abuse behavior. To reduce prescription opioid use, the ICPTTP standardizes and streamlines chronic pain management in North Carolina primary care clinics. The Morrison County ACH brings together community stakeholders to reduce opioid use and overdose in Minnesota. Medicare Part D Opioid Prescribing Mapping Tool – An interactive tool from CMS that shows opioid prescribing at the state, county, and zip code level. Department of Veterans Affairs Opioid Prescribing Data – A map showing VA facility opioid-dispensing rates. Opioid Overdose: U.S. Prescribing Rate Maps – County-level prescribing rate maps from the CDC. Pain Management Best Practices Inter-Agency Task Force – Includes representatives from U.S. Department of Health & Human Services agencies, the Departments of Veterans Affairs and Defense and the Office of National Drug Control Policy. Indian Health Service: Pain Management – Resources to help address the challenges providers face helping patients with chronic pain while preventing illegal or harmful use of opioids. Rx Awareness – A CDC campaign to increase awareness of the danger of prescription opioids. Six Building Blocks: A Team-Based Approach to Improving Opioid Management in Primary Care – Provides a structured approach for improving management of patients on chronic opioid therapy. Offers a self-assessment and implementation guide. Quality Improvement and Care Coordination: Implementing the CDC Guideline for Prescribing Opioids for Chronic Pain – A guide to help primary care providers, practices, and healthcare systems manage patients who are on long-term opioid therapy. 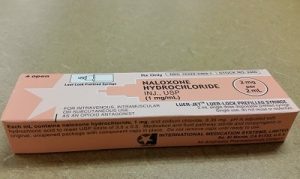 Programs that train rural first responders, community members, friends, and family members to administer naloxone to prevent an opioid overdose. NROOR, led by a Critical Access Hospital (CAH), furnished naloxone and provided education on prescription opioid use and overdose. To reduce deaths from opioid overdoses in rural Maine, the MaineGeneral Harm Reduction Program provides community education and naloxone training for healthcare staff and first responders. Project Renew provides naloxone training and certification to first responders, healthcare staff, and laypeople in West Virginia in order to reduce the number of deaths from opioid overdose. The San Luis Valley Area Health Education Center has initiated opioid-related education efforts for health workers and the larger community in addition to establishing a naloxone distribution program. A Maryland program educates healthcare providers, EMS staff, and laypeople on the risks of opioids, prevention and treatment options, and Narcan training. SAMHSA Opioid Overdose Prevention Toolkit – Guidance for community members, first responders, prescribers, patients, and families in responding to an overdose, including information on administering naloxone. Rural Opioid Overdose Reversal Program – Toolkit offering training materials, marketing and outreach examples, and lessons learned for developing an opioid overdose reversal program. Strategies to prevent and treat the consequences of opioid injection, including HIV, hepatitis B and C infections, and other sexually transmitted diseases. Nine grant awards co-funded by the CDC, National Institute on Drug Abuse (NIDA), the Appalachian Regional Commission (ARC), and the Substance Abuse and Mental Health Services Administration (SAMHSA) to help communities prevent and treat consequences of opioid injection. Integrating Responses at the Intersection of Opioid Use Disorder and Infectious Disease Epidemics – Proceedings from a workshop focused on the link between the opioid crisis and infectious disease such as HIV and HCV. Includes rural information. The workshop presentations are also available. Infectious Diseases and Opioid Use Disorder (OUD) Policy Issues and Recommendations – A report that highlights policy considerations, including those focused on rural settings, for addressing infectious disease linked to injection drug use. Managing HIV and Hepatitis C Outbreaks Among People Who Inject Drugs: A Guide for State and Local Health Departments – A guide from the CDC, with information on outbreak preparedness and detection, investigation, and response. Syringe Services Programs – CDC guidance on how states, tribes, and territories can request a determination of need for SSPs, which would allow use of federal funds to support this service. Threading the Needle – How to Stop the HIV Outbreak in Rural Indiana – A New England Journal of Medicine perspective piece describing steps taken to address an HIV outbreak tied to injection drug use. Medication-assisted treatment for patients with opioid use disorder in rural Northern Michigan. Helps mothers who used substances to get treatment, including medication-assisted treatment, and provide safe, drug-free homes for themselves and their newborns. Increasing Access to Medication Assisted Treatment of Opioid Abuse in Rural Primary Care Practices – The Agency for Healthcare Research and Quality announced 4 awards to provide MAT to 20,000+ people in rural areas using innovative technology. Implementing Medication-Assisted Treatment for Opioid Use Disorder in Rural Primary Care: Environmental Scan, Volume 1 and Volume 2 (Tools and Resources) – Agency for Healthcare Research and Quality reports that summarize findings from the literature and identify tools to support MAT. UDS Mapper – The UDS Mapper provides access to Mapping Areas of Priority for Medication-Assisted Treatment (MAP for MAT), a tool to assist in identifying areas of high need and existing services. This mapping tool includes HRSA-funded awardees and health facilities related to the opioid epidemic and population indicators including drug poisoning mortality, opioid prescribing rates, and information on DEA waivered providers, who can prescribe medications used for MAT. Free, but registration is required. Health care providers, law enforcement, community organizations, friends, and family members are working together to make it easier for people to get needed care for opioid addiction. A Community Health Worker/ Certified Recovery Specialist training program that prepares people who are recovering from substance abuse to provide peer support to others with substance abuse issues. ARMOT provides 1) case management and recovery support services to individuals with substance use disorders and 2) education and support to rural hospital staff, patients, and their loved ones. Read more about ARMOT in the Rural Monitor: Pennsylvania Mobile Team Addresses Substance Use Disorders. Treats patients with substance addiction in rural South Carolina with a mixture of counseling services and medication-assisted treatment. A statewide treatment access system using a hub-and-spoke approach to provide access to comprehensive opioid use disorder treatment. Identifies federal and state strategies to address treatment capacity, including expanding the workforce authorized to prescribe buprenorphine and using technology to provide treatment. Highlights how Scott County, Indiana responded to an HIV outbreak related to opioid use disorder (OUD) by addressing the barriers to care faced by people with OUD and HIV. Become an NHSC Site – Information on eligibility and application instructions for becoming a National Health Service Corps site, which allows facilities to recruit and hire NHSC providers, including those specializing in mental and behavioral health. The NHSC has added new categories of outpatient services and sites eligible for NHSC to address the opioid crisis. Opioid Epidemic Practical Toolkit: Helping Faith and Community Leaders Bring Hope and Healing to Our Communities – Center for Faith-based and Neighborhood Partnerships toolkit providing practical steps that community and faith-based organizations can take to help address the opioid crisis. The Partnership Center also offers a collection of videos. The Opioid Use Disorder Prevention Playbook – Identifies 11 evidence-based strategies communities can use to help address the opioid crisis. Project ECHO is an evidence-based approach where primary care providers and specialists work as a team to manage chronic complex conditions of rural patients and to increase the knowledge base through shared case studies. Among other areas of focus, the Project ECHO model is being used to help meet needs related to rural opioid treatment. Telehealth as Means to Diagnose and Treat Opioid Abuse – Highlights specific ways telehealth could be used for diagnosis and treatment in rural areas.